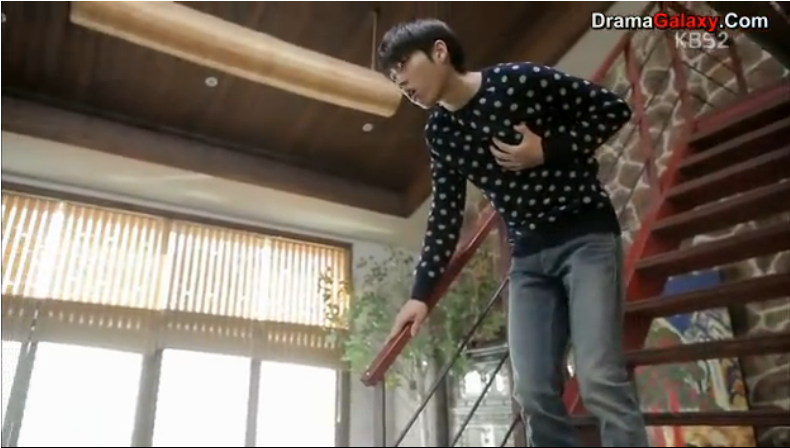 The 17th episode starts with Do-Young finding Jung-Soo and they cry and hug together. Do-Young asks if she resented her and Jung-Soo tells her that she didn’t and she was just happy that she was okay and came back to Korea. Jung-Soo tells her about the promise and Do-Young tells her that she will never let go of her hand again. They go to the beach and she tells her about coming to the house and leaving notes and they talk about old memories. Do-Young comes home and Kyung-Hee is making supper very cheerily. They sit down to eat and Kyung-Hee pours them a glass of wine and tells them that she loves salmon steak because Mr. Woo made it for them when she got into college and that it was her favorite meal. They start to eat and Do-Young gets up and leaves Kyung-Hee pretends she doesn’t know why and lets Mr. Woo go to her and Kyung-Hee eats while crying. Do-Young thinks that Kyung-Hee knows that they know and is trying to put in effort and Mr. Woo says they should wait for Kyung-Hee to say something first. Jung-Soo is pricing some materials and she with the other market designers discuss making their own luxury brand if they use quality materials. Jin-Hoo meets Director Choi at work and asks how his grandpa is doing and he tells him that he is getting better and will come back soon. Director Choi says that is good because he thought he would have to recommend an acting president. Kyung-Hee goes to see Manager Kang and asks him why he has to take responsibility for the factory management. He tells her that they want him to leave because he betrayed Director Choi. Kyung-Hee gets mad at him and tells him that she broke up with him because he has no dreams or ambitions. She tells him that she knew about the offer from Red Milano and that he should have took it for himself and there was a lot of ways that he could have paid back Director Choi. He tells her that they have different dreams and that she couldn’t see his and that she is the one without a dream because all she has is useless desires. Jung-Soo goes to eat and gets an omelet rice which makes her remember when Jin-Hoo made it for her and she starts crying. Uncle goes to visit Kyung-Hee and tells her to come home because Do-Young and her husband know everything and she tells him she will only leave when they kick her out. Director Choi sees Uncle leaving and tells his assistant to find out who he was visiting and comes back and tells her it was Kyung-Hee. Manager Kang comes and gives Director Choi his resignation. Jin-Hoo is with his grandfather and he still has not awakened. Jung-Soo, Uncle, and Shim Min-Kyung a young designer from the market have opened up their own business. Manager Kang comes and gets introduced when he is alone with Jung-Soo he tells her he resigned and that he would like to come work for her for free. He tells her that Jin-Hoo is having a hard time because his grandfather has gotten worse. The assistant tells Director Choi that Kyung-Hee is adopted and that she is the niece to Uncle because his sister died of a brain tumor. Director Choi orders Kyung-Hee to his office and at the same time his wife is there and when Kyung-Hee gets there she makes them all go out to eat together. Jung-Soo and Do-Young are out eating together and Do-Young asks how her business is going and asks if she needs help. Jung-Soo tells her that when she needs help she will ask just the way she taught her. Director Choi and his wife and Kyung-Hee go the same restaurant and they all sit together. Kyung-Hee explains that Jung-Soo also worked at Shin Hwa and Jung-Soo explains that she was Kyung-Hee’s classmate and that is why Do-Young is out with her. Director Choi asks questions about Kyung-Hee. Jung-Soo and Do-Young leave the restaurant early. Aunt is outside Do-Young’s house and Do-Young comes home and Aunt tries to plead with her to listen and Do-Young walks away. Aunt sits outside the house and Kyung-Hee comes home, she tries to persuade Aunt to leave but she won’t. Aunt tells her to blame the whole thing on her, to tell them that she was the one who forced her to go and that she didn’t want to but had no choice. Do-Young at home remembers when Kyung-Hee put in a lot of effort and rubbed her legs. Mr. Woo asks her what she would think if they sent Kyung-Hee to the American branch so they don’t have to kick her out. Kyung-Hee comes home tipsy and goes to bed and cries. Director Choi is meeting with Kyung-Hee and tells her about her birth mother sending him the book on how to process fabrics and that it is a misunderstanding between him and Uncle. He asks her if she has heard anything from her father. Kyung-Hee goes to Aunt and Uncle and asks them if they know Director Choi and they tell her that he had a relationship with Jung-Soo’s mom but in the end he stole the book. Kyung-Hee then figures out that Director Choi is Jung-Soo’s father and she says she can’t let this happen when she is alone. Jung-Soo goes to her work and tells them that Charlotte the department store is looking for a popup store for the fall and winter season and that is is a great opportunity for them. So they decide that they are going to try to get their brand in the store. Manager Kang gets a call from Jin-Hoo saying that his grandfather is in critical condition so he runs down to the hospital. When he gets there the doctors are trying to save the President and they have to use the defibrillator but they can’t get his heart beat back and he dies. Manager Kang texts Jung-Soo the news and she is shocked. The President’s funeral happens. Manager Kang drives Jin-Hoo home and Jung-Soo is hiding in the bushes but isn’t seen by Jin-Hoo and she starts crying. Jin-Hoo packs a bag and puts the giant teddybear in the trash. Jin-Hoo goes outside and has flashbacks where Director Choi took him fishing and he asked him to be his father. Jin-Hoo goes to work and he remember a couple of men telling Jin-Hoo that they support him as the president. Jin-Hoo and everyone goes to the meeting to appoint the new President and almost everyone votes Director Choi and a couple of men that don’t raise there hand eventually raise it. Jin-Hoo storms out and meets Kyung-Hee and asks if the engagement deal is on the table and she tells him yes and he tells her that they should get engaged and this is how the 17th episode ends. So Director Choi has finally figured out that he has a daughter!! but now he will think it is Kyung-Hee! ugh and Kyung-Hee will try to hide the truth from her again! It is pretty exciting that Jung-Soo is starting her own company and that Manager Kang is joining them! I thought that maybe Jin-Hoo will be joining them now that he was not allowed to be President! but now he wants to get engaged with Kyung-Hee! I am not sure how that is going to help? The board members would want this to happen and make him president because he is making connections between the 2 companies? I am so happy that Jung-Soo and Do-Young have been reunited! I have been waiting for that to happen for so many episodes!! but they do not know what to do with Kyung-Hee! I mean couldn’t they just get an apartment for her or something? Thanks everyone for voting! lol it seems like Jin-Hoo and Jung-Soo ending up together is the most wanted, but I have to say Kyung-Hee feeling pain has a strong number of votes as well! !